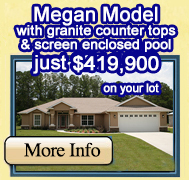 New Swimming Pool Construction and Swimming Pool Remodeling in West Central Florida. 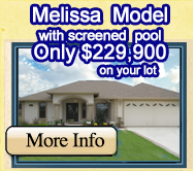 Pool: 3' to 5' standard depth, 8” concrete beam around rim of pool, structural concrete walls and floors. 4,000 P.S.I. concrete. 3/8” steel re-bar tied in 12” x 12” squares. Choice of stair design, 3 steps with side seats. 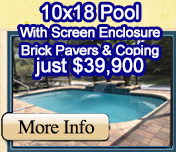 Full 6” x 6” pool tile with cantilever decks. 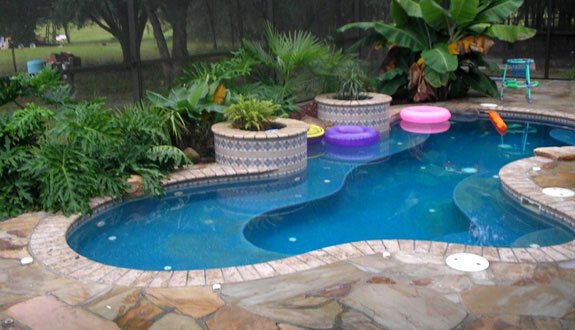 Choice of pool shape, choice of shallow and or deep side benches. Deck: 4” concrete pool deck with steel re-bar reinforced footers. 3,000 P.S.I. fiber mesh reinforced concrete. High strength textured acrylic deck. Two coats of acrylic finish (choice of color). Stainless steel hand rail and swim out. 6' of deck along house side. 5' of deck on shallow end. 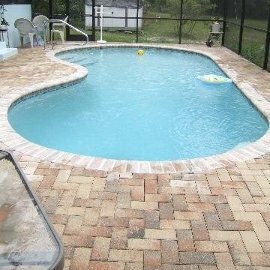 3' of deck on deep end and far side of pool. Deck control joints at stress points to minimize deck cracking. 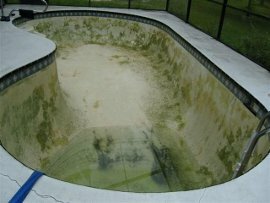 Deck drain system between house and concrete pool deck. Plumbing: two (2) main drains with anti-vortex covers for added safety. Pump and filter sized to pool. Automatic chlorinator with built in check valve. Skimmer and main drains valved individually for more accurate water flow. A minimum of three (3) pool return lines with directional eye balls and vented main drain. 2” plumbing on suction and returns. Electrical: 12 volt underwater light. Automatic time clock. Electrical hook up of equipment to exterior stub. Screen enclosure, hand rail, steel in pool shell, footers, pool light and pump bonded (grounding) for added safety. Enclosure: Eight (8) foot walls. Choice of bronze or white enclosure. Choice of hip, gable or mansard roof. Aluminum chair rails. 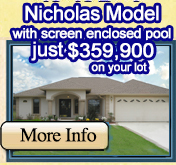 Two (2) doors on 14' x 28' or larger pool. Super gutter and down spouts as needed. Enclosure engineered to withstand Hurricane force winds. Cleaning Equipment: All start up chemicals. Hand held telescope pole, vacuum head, flexible vacuum hose, 18' wall brush, leaf net, test kit, instruction booklet on pool care, and job site pool instruction by Community Builders representative. All Permits and Custom Drawn Plans by Community Builders, Inc. Pool Prices as of Jan 27, 2017. Prices subject to change without notice. Please note: Enclosures over 8' high walls are priced extra.